A 16th century Austrian, Hans Steininger, was famous for having the world's longest beard - and for dying because of it. Hans was proud of his nearly 1.4 m. long beard. He used to keep his beard rolled up in a leather pouch, but failed to do so one day in 1567. 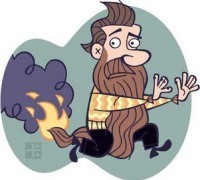 A fire broke out in his town that day, and in his haste to evacuate, Hans forgot to roll up his beard. He accidentally stepped on his beard, lost balance and stumbled. Apparently, he fell down the stairs and broke his neck. See also: www.forteantimes.com, science.howstuffworks.com, books.google.nl. Interesting story, Joan. I've never heard of someone's "death by beard"; how unfortunate for Hans. Thanks! I tried to add a few short, flighty posts during the summer holidays, but have had no clue if people liked it, except for one earlier post being popular.